is quaint-looking. It's the only one in town. I must confess I've never been there - but as part of this project to get to know my town better, maybe I'll stop there for a drink soon! It doesn't look too threatening, but you never know. It may be an Angels hangout. Proceed with caution. It always seemed a bit rough to me - other neighboring towns have more "upscale" places to get a drink - fewer bikers, more yuppies! But I'm sure it's fine - just the guys who work on the roads and phone lines and estates probably go there after work! Isn't this a gorgeous old building though - wow! i have to agree with chris.h. - perhaps it's time to head over for a nice cold one. love the building! Jenny, I'm shocked! Are you stereotyping my tavern friends? As so many Sharon folks do. I've lived in sharon now for close to 11 years. 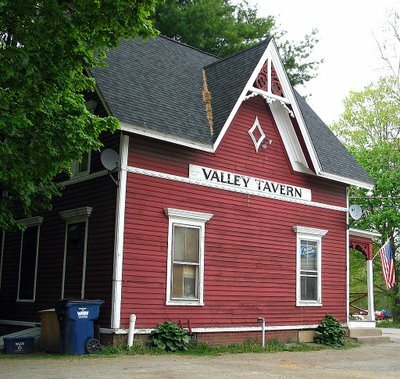 The first week I lived here I walked into the tavern past all of the looks, (no different than any looks you may get at those upscale places) and had a few drinks. Within minutes I was engaged in conversation with a local who welcomed me to the Tavern. I have been going there on and off since. As far as the bikers go, I myself am a biker. I wouldn't be surprised if you have seen me around Sharon and thought, "there's trouble" then unknowingly sat close to me at one of our local, "upscale places". There are no gangs hanging out at the tavern. Most bikers you see there are out for a ride on a weekend and chose the tavern as a destination. They stop in, chat have a drink and head out. The regular customers that frequent the tavern are very down to earth. The kind of folks that would help out a friend or stranger in a pinch. Let me put it to you this way, The next time you are in one of our local "upscale places", walk around and strike up conversation with people you do not know. Then try the same approach at the Tavern. Don't be surprised if you feel more welcome at the Valley. Be careful though, someone is likely to buy you a drink. I'm sure you are aware of the old tavern tradition of ringing a bell when someone buys a round. Yes, there is a bell hanging on the bar. And it is just about worn out! BTW, One of the regulars found this blog, printed it out and posted it inside the Tavern. Everyone found it rather amusing. Don't be afraid to stop in. You might like it. You can be yourself and nobody will judge you. Consider this an invitation. If you can't do it alone, bring a friend. I'll be waiting to buy you a drink. Sorry, only beer and little wine bottles there. Wow, Mike, I am delighted that this post found its way into the Tavern, and I will find my way there soon too (hopefully you're right - people won't be too offended at the discussion here, or anything I said!) Here's a story about bikers, by the way: my children had a lemonade stand a month or so ago. For an hour they sat there, and nobody stopped. (It was great lemonade - all homemade, and only 25 cents a cup.) Finally a gentleman on a motorcycle stopped, bought 2 cups, and praised them highly. He was the only person who passed by that day who cared to do something kind for 2 little kids! I find this quite amusing. Jenny, I can't wait for you to come have a beer with us at the Tavern. Hopefully it will be a day when I am working and a day that Mike is there as a customer. Mike is right, a local did google search the Sharon Valley Tavern at 5:30am in the morning and came up with your page. I thought it was cute and wanted to hang it up so others could read. Mike really summed up what the Tavern is all about and left nothing else for me to say, other than stop in sometime. If money is tight, we have happy hour on Thursdays from 4-6:30pm. Come check it out for yourself- thanks for the positive note. Hope to see you soon.